"and by the way, you forget the Apollo 17 explosive charges"
And the Apollo 16 mortars, 3 of which were fired. Apollo 14 had the same but they were not fired. "Being a private mission is the realisation of the follow on missions in any way tied to this one successfully achieving its objectives?" Success on this mission would certainly help. Could this result in first lunar explosion in the history? After landing there's enough fuel left for a hop which won't be performed, and temperature will raise to 180°C without any thermal control. I would be surprised if the Israeli engineers haven't thought of a way of purging fuel lines after landing, as is done on every other planetary lander. You are comparing a 10 billions mission to a 0.1 billions mission. Something (like thermal control) had to be discarded. I imagine a scenario where, after first fully functional day, they have to decide if to hop or not. "Ok, let's keep the fuel, just in case we want to hop tomorrow..." OR "let's give up, we'll hop next time. Wait. Will it BE a next time? When? Give up? Why give up? all is working fine... discussion... discussion.... BOOOM"
New TLE corresponding with spaceIL. 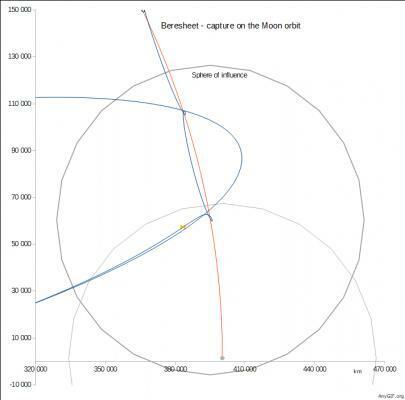 Today, at 12:30 UTC, a successful maneuver of Beresheet was carried out on its way to an elliptical orbit, that matches the planned Moon meeting, where the farthest point from Earth is about 405,000 km away. During the maneuver, Beresheet's main engine was activated for about 60 seconds. The spacecraft systems function as expected, communicate with the control room at Yahud, the flight control and flight dynamic teams managed to minimize the difficulties in star tracking by adapting the star tracking activation pattern so that all subsequent maneuvering stages are directed to space rather than to the Sun or Earth. As the space travel continues, the amount of fuel in the spaceship tanks decreases, so this week we operated a "momentum wheel" that stabilizes the movement of the spacecraft so that the fuel shake in tanks will not shake it. The engineering team is preparing to perform some small maneuvers to improve the spacecraft's path to the moon "capture" which is expected on 4 April. 60 sec? about 60 sec? interval from 55 to 64.99 sec? Not sure why the first period listing is the old, smaller value, but the rest shows the new orbit and maximum altitude. Regardless of what happens, Beresheet will be a Moon Mission of some type. Very much looking forward to further success. According to the Planetary.org Table 36 hours after PM3, OPM Out of Plane Maneuver should follow. According to TLE, the change in inclination is from 27.26 ° to 25 °. I usually follow the ellipse parameters and neglect this parameter in 3d. Has SpaceIL merged these two maneuvers into one? Would the burn-time match such a change? for such a change in perigeum, the engine would have to burn for 60 minutes. On Wednesday at 14:30 Israel Time an Out Of Plane Maneuver was carried out to change the inclination of the orbit. This comes to optimize the moon capture path, to avoid passing behind the moon in inconvenient time and to avoid entering into the shadow of the moon. It's all in Russian, but the images or graphics are mostly English. I made an animation to capture the probe in the orbit of the Moon. Video of #Beresheet's landing leg deployment, recorded shortly after separation from the Falcon9 second stage on February 22. In the background, the launcher with the main payload, making attitude correction. Also in the background, the Moon.